New Horizons is en-route to 2014 MU₆₉, where it is planned to fly by 1 January 2019. Considering fuel and other considerations, how close to 2014 MU₆₉ can it get? 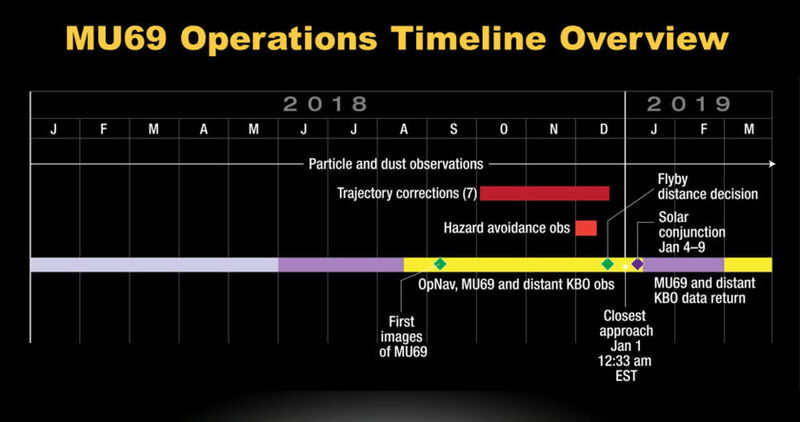 The flyby distance will depend on how accurately they can measure 2014 MU69's orbit. This KBO was discovered only 3 years ago, and because it's so faint we only have a few observations to go on. For the Pluto encounter, the NH team went back to the Lowell observatory archives to measure the original plates made by Tombaugh when he discovered Pluto, in an effort to improve the accuracy of Pluto's position data. With far less data to go on, 2014 MU69's orbit will have some uncertainty. This uncertainty will be mainly in the direction along NH's trajectory, so it's the timing of the flyby that will be difficult. As a result, there'll be an uncertainty in flyby distance as well. As of January 2016, the science team is targeting a flyby distance of 2000-3000 km. Edit: In December 2017, another course correction was made and the flyby distance is planned to be 3500 km. There's a contingency plan to increase the flyby distance to 10,000 km if obstacles (moons, rings, etc.) are detected. The final decision will be made in December 2018, based on observations in the months before. As close as they think can safely be achieved. I expect that will be in the range of hundreds of km, but that's purely speculation. It should be a fair bit closer than Pluto, however, because there they do not have to worry about flying too close to debris orbiting 2014-MU69. It's Hill Sphere is only about 400,000 km, and it seems likely that there wouldn't be any object of significance much closer. It seems the team hopes to have it's closest approach be less than 1000 km, from social media posts. They have plenty of fuel to exact target it (within the uncertainty of it's position and New Horizons), and in fact, with the surplus of fuel they have, I expect it will basically target it spot on. Incidentally, the first burns have already started to aim New Horizons at 2014-MU69, as described in today's New Horizons mission news article. The biggest difficulty, at least initially, is likely targeting it precisely, as there is significant uncertainty in it's orbit. No doubt further studies, including from New Horizons, will help to refine its location. EDIT It seems like the planned distance to target is about 1900 miles, per American Space. That is 4 times closer than Pluto's flyby. Not the answer you're looking for? Browse other questions tagged new-horizons flyby 2014-mu69 kuiper-belt or ask your own question. What's after Pluto for New Horizons?